The firm competes in quality, capacity, and experience with the largest firms, but its structure provides clients with an attorney- client relationship that is personalized, responsive, and direct. Our goal is to treat our clients as business partners, to combine excellent legal skills with good business judgment and to play an active role in helping our clients succeed. The attorneys at Kennedy, Archer & Giffen represent a history of legal practice in Monterey County which stretches back for more than thirty years. The firm began in 1997, formed by Nolan Kennedy and Dan Archer, each of whom began his practice with the Monterey office of Hoge, Fenton, Jones & Appel. In 2001, they were joined by Jon Giffen, who had been practicing in Salinas, and by the attorneys with the firm of Harray & Linker. Since then, Kennedy, Archer & Giffen has continued to grow, adding transactional lawyers and litigators to strengthen its legal service capabilities. We currently assist companies in a variety of industries with organizational and compliance matters, buying, selling and merging businesses, forming joint ventures, and general business planning as well as counseling regarding corporate and partnership operations. Our clients vary widely, and include major corporations, privately held businesses, insurance companies, investment partnerships, and entrepreneurs. Our business lawyers counsel all types of business entities, including profit and nonprofit corporations, partnerships (both general and limited), limited liability companies, and joint ventures at many different stages in the business life cycle - from selecting the form of business entity and capitalizing and financing the organization, through mergers, acquisitions and dissolutions. Transactions in which the firm has provided business counsel have included a merging of a local high technology company into a publicly held company; merging a Northern California chain of automobile lubrication centers into Quaker State Corporation; organizing a joint venture to develop approximately 800 acres of real property into estate-size homes; establishing and administrating an employee stock option plan for a large agricultural firm; obtaining capital through a private securities offering for a local health care facility; the sale of a group of restaurants in Santa Barbara and San Luis Obispo Counties; organizing a number of non-profit organizations and obtaining tax exempt status for them; and the acquisition or sale of a number of other business interests. Nolan M. Kennedy has practiced law on the Monterey Peninsula since 1973, primarily in the areas of business transactions, business and non-profit organizations, real estate and health care law. He has written and lectured extensively in legal areas and is co-author of the chapter on Options in Real Estate Transactions, published by the California Continuing Education of the Bar. Mr. Kennedy is active in the local community. He is on the Board of Directors of the Monterey County Property Owners Association, serving two terms as president. He served 11 years on the board for the Carmel Bach Festival, and is a past board member of the Monterey Peninsula Chamber of Commerce and Volunteers in Action among other community organizations. He is on the Board of Directors of the Monterey County United Way, and was Chair of the Board for 2004-2005. 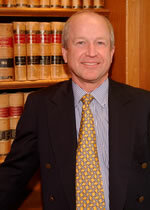 Currently, he is a member of the State Bar of California and the Monterey County Bar Association, for which he served on the Executive Committee, and the American Health Lawyers Association. Mr. Kennedy is a graduate of Baylor University in Texas and the University of California Hastings College of Law. While in law school, Mr. Kennedy received the Order of the Coif, and was a member and managing editor of the Hastings Law Journal.